A wastewater hauling and treatment company in Canada required a treatment process complying with ZLD (Zero-Liquid-Discharge) of a wide-range of polluted wastewater from a multitude of sources. 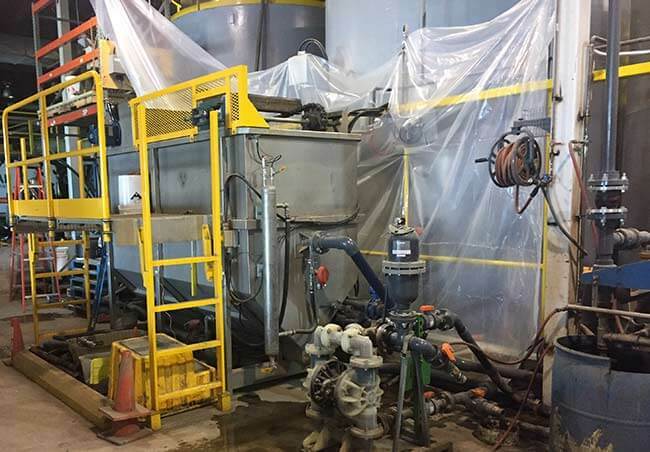 Due to the wide variety of wastewater that the client would be contracted to haul away, it was necessary to provide a method for the removal of non-emulsified oil prior to the DAF. An Oil-Water Separator (OWS) SkimLoop system, by Ecologix Environmental Systems, was the perfect solution for this. The SkimLoop was installed to the side of a tank designated for the storage of oily wastewater. This allowed the unit to siphon the free-floating oil from the surface of the water as it accumulated. The siphoned oil was then stored in separate 55-gallon drums to be sold later. The client wanted the ability to process up to 150 GPM of wastewater at a time. The VLT-410 DAF was selected as the method of treatment in order to both chemically precipitate and physically separate out the pollutants, such as Total Suspended Solids (TSS) out of the wastewater. Then, the treated wastewater is stored in a series of storage tanks. From the storage tanks, the treated water is then pumped from any individual tank directly to the 1,500 GPH evaporator where it is evaporated into the atmosphere, thereby making this site fully ZLD compliant. The entire process of water treatment was made fully automated, and the results for the client have been exactly what they aspired for.